This sequel suffers from what I’ve dubbed “Bourne Syndrome.” Ever since The Bourne Identity films were released you can’t make a “dumb” action movie anymore. It’s got to be smart and witty and serious and fast and bigger and… ugh sometimes it’s all too much. Except the Die Hard movies were never dumb to begin with, so why mess with a formula that works? The basic premise of the first three Die Hards is that John McLane is the only one capable of saving the day, usually by virtue of him being the only cop in a position to do anything. Not always the most believable situation, but it worked because the way the character dealt with his circumstances felt realistic. McLane always came across as a slightly above average police officer in some respects, but in other ways he was somewhat inept and relied on the expertise of others. In other words, he was a real human being with strengths and flaws. The John McLane presented in Live Free is beyond unbelievable. He’s launching police cruisers into helicopters, and crashing cars down elevator shafts, and evading jet fighters in a semi-truck. It’s not just that I doubt McLane’s ability to do these things, it’s that he’s also 12 years older than he was in the previous film. Not only that, but he seems to come out of most of this with hardly a scratch on him. By the end of the previous three films McLane is covered in blood and dirt. It was funny, but also made sense given he had just survived three of his worst days on the job. Where’s all the grit now? Because in the end Bruce Willis is looking pretty damn fresh and clean. Basically, John McLane has morphed into a superhero. He’s now in the same league as your typical Arnold Schwarzenegger, Jean-Claude Van Damme, or Sylvester Stallone character. Personally, I preferred it when he was the antithesis of these macho men– just a New York cop who was insecure about his marriage, nervous around his in-laws, and struggling with alcoholism post-divorce, who just happened to get himself into tough spots, but always managed to find a way out. I can’t wait until the Average Joe to become popular again. It was a damn good idea. I’m not sure what happened with this film. It’s almost like the filmmakers never even watched the first three, because this fourth John McLane adventure is so different from any of the others that preceded it. What made McLane a great character was the way an audience could relate to him because he seemed like a real man who just always ended up in the wrong place at the wrong time, but this film turns him into a superhero that seems immortal. In the first three films, McLane always seemed in danger. You know he would likely make it out alive, but there was still a sense of danger in them that had you on the edge of your seat. Die Hard 4 does not have that quality. You never feel like John McLane is in any danger, he seems like a larger than life hero, not the ‘every man’ we came to love in the first three films. 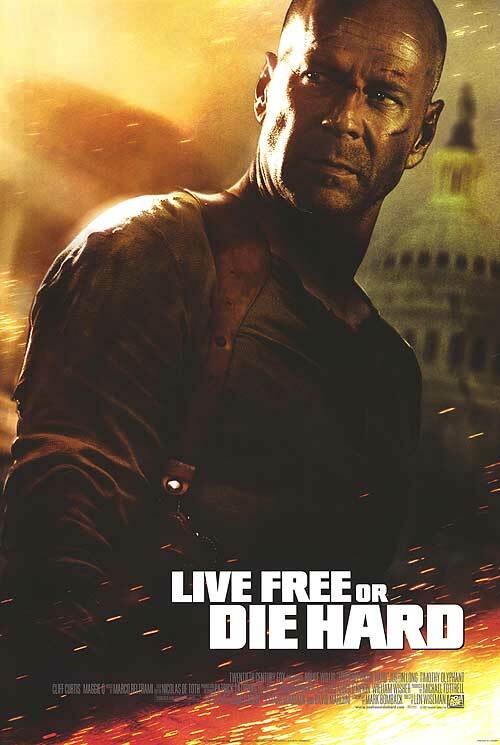 Die Hard 4 is set during the American July 4th holiday. McLane (Bruce Willis) gets caught up in a cyber-terrorist’s (Timothy Olyphant) plot to attack the USA government’s network. McLane teams up with a young hacker (Justin Long) to stop him, while also trying save his relationship with his young daughter, Lucy (Mary Elizabeth Winstead). I was not impressed by this film, it has taken everything that made John McLane great and turned him into a generic hero. This is nothing more than a collection of explosions following an ageing Bruce Willis around Washington DC. The only positive I can say about this film is that it is still better than the terrible fifth instalment, A Good Day to Die Hard. That movie was so awful, even I don’t own it.